Mental Health Month NSW is part of a national mental health promotion campaign held throughout October each year. This year’s theme, set by the Mental Health Association NSW is ‘Value Your Mind’. 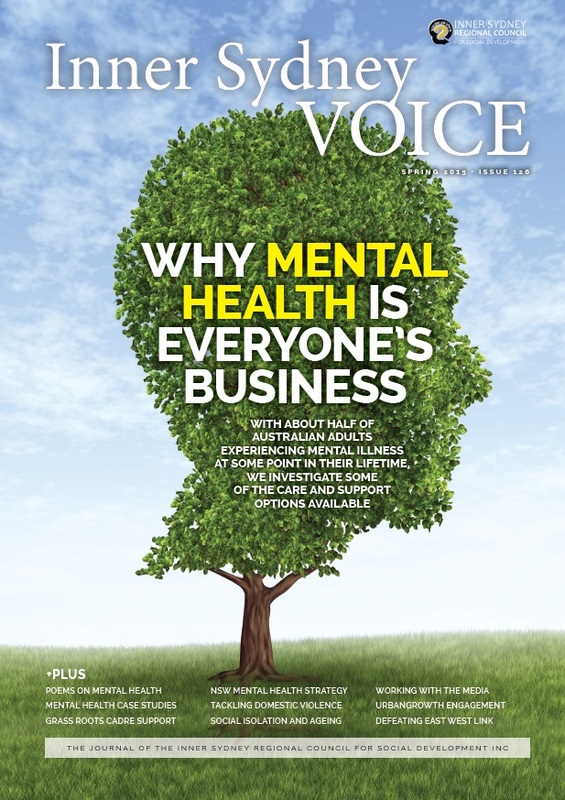 As our Spring ISV coincides with Mental Health Month, we felt it appropriate to have a focus on mental health and well-being in this issue. Given that each year 1 in 5 Australians will experience a mental illness, it is likely we all have been or will be impacted by someone’s mental ill-health, be it a family member, a friend or a neighbour. We all need to work on maintaining our own mental health. This issue Vicki Johnston challenges us to Let’s talk about domestic violence – to explore the problem and see what each of us can do about it. The physical scars and wounds heal much more easily than the deep wounds of emotional and psychological abuse, so this article also sits well with our mental health focus. The 2014 Mental Health Commission report sets a new direction making Mental health in NSW is everyone’s business. Its ten year strategic plan provides a good framework but From the Vault – Mental Health Rights – Spring 1993 on Brian Burdekin’s 1993 report, reminds us how slow progress so far has been. under the Personal Helpers and Mentors (PHaMS) programme. In City Cadre Connect Charmaine Jones explores the background to the grass roots inner city Cadre programme that looks at how all community members can respond on mental health issues. Two Cadre participants Bill Yan and Douglas Holmes encourage you to support the Inner City Team Marbles challenge a yearly event that coincides with Mental Health Month in October. Social isolation is a big factor in mental health. Enis Jusufspahic explores Social isolation and mental health during ageing while Jen Aboki’s solution to isolation is to get people talking with Care 2 Converse: Inspiring Conversations between Strangers. To help you get your story out, Bruce Wardley in Working with the media : An insider’s view shares his experience of working with the media. On urban renewal in UrbanGrowth NSW: Participation a Key to City Transformation Abbie Jeffs explains what communities should expect from UrbanGrowth’s community engagement, while Crystal Legacy and Daniela Minicucci explore what lessons Sydneysiders might learn for WestConnex From a ‘done deal’ to ‘no deal’: defeating Melbourne’s East West Link. Charmaine Jones & Geoff Turnbull – Co-editors Inner Sydney Regional Council for Social Development.